The care cream leaves your hands Coslys soft hands and gently scented with apple extract bio. The formula is rich in nourishing ingredients and repairers such as shea butter, organic jojoba oil and oil sweet almond. It has the advantage to penetrate quickly without leaving a greasy film and protects your hands from external aggressions. Rich in nourishing ingredients from organic macadamia oil, organic apricot, organic jojoba and sweet almond, its non-greasy formula strengthens nails and protects your hands from external aggressions. 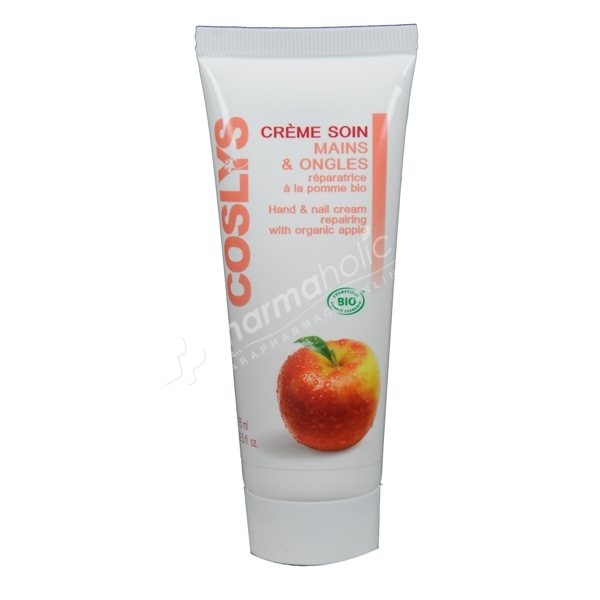 The care cream leaves your hands Coslys soft hands and gently scented with apple extract bio. The formula is rich in nourishing ingredients and repairers such as shea butter, organic jojoba oil and oil sweet almond. It has the advantage to penetrate quickly without leaving a greasy film and protects your hands from external aggressions. essential oil organic lemon helps reduce age spots on hands. It will be your ally smooth everyday. Apply several times a day to prevent drying of the thin and fragile skin of the hands.